I put in for the Ryuutama Kickstarter last year. Although I'm not expecting a finished PDF or book until later this year, the backers did receive a Christmas present in the form of a pre-release rough draft of the rules. It's a heartwarming game of travel and wonder, where ordinary people set off on difficult and fantastic journeys. Rather than focussing on combat, the emphasis is on the journey itself. The environment can be your worst enemy, and a bad meal or an uncomfortable night's sleep might do you more harm than an encounter with wild beasts! I'd like my fiancée to play, but she's going to be super-busy with work for the next few weeks. I figured in the meantime I might get a better feel for the system by playing through a solo journey. Since Ryuutama focusses on ordinary townsfolk travelling overland in difficult and dangerous terrain with the ever-present threat of monsters, people usually travel in groups. For my test, I'm going to play a solo character on a lonely journey. I don't expect it to go well, but I'll follow her along and just see what happens. Since I'm effectively the GM and the player, I've made up a random terrain chart and put together a small map to explore in "hexcrawl" style. 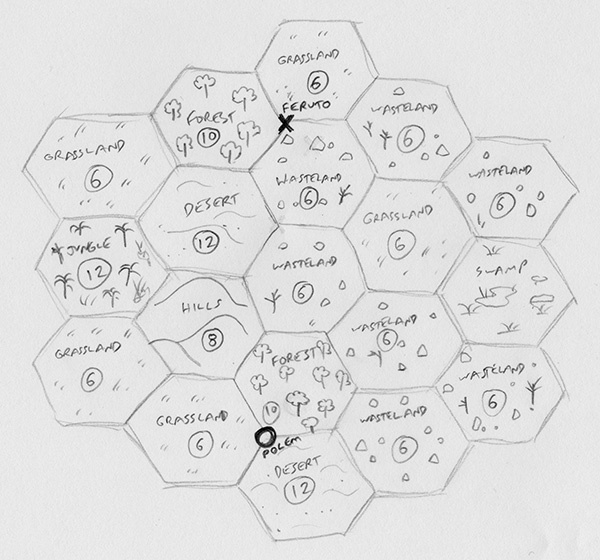 I put a couple of settlements at hex intersections, Settlers of Catan style, so there are three ways to approach or leave a town. I may also come up with a random encounter system, so I can impartially see if I run into any monsters. Since the GM character, the Ryuujin, gets hardly any ability to influence the journey until it's overseen at least one trip, I'm not going to bother making a fully detailed Ryuujin. By default, it'll be a Green Ryuujin with an Encyclopedia, meaning it's a game about travel and I'll be running it "by the book". I figured a Hunter/Technical type character might be fairly self-sufficient. Hopefully the ability to track monsters and turn them into food will increase survivability. The well-travelled Minstrel class does get a bonus to all Travel checks, so maybe they would be a better choice for a single-player game, but oh well. I'll see how we go. I play Clover Hartfeld, a female Technical Hunter who wields a boar spear. I went for a stat spread of Str d8, Dex d6, Int d6, Spi d4. This gives her 16 HP and 8 MP. From her Hunter Class, she gains the ability to track monsters and inflict +1 damage on monsters thus tracked; she can turn defeated monsters into materials such as food and gear; and she can hunt small creatures when camping to increase rations. Unfortunately, this last skill is in lieu of the nightly Camp Check, so she won't really be able to use it when travelling solo. Thanks to her Technical Type, she has Initiative of 2d6+1, a Carrying Capacity of 14, and gains a +2 bonus on Concentration checks instead of +1. Clover was hunting in the forest near the town of Polem with her older and more experienced brother, Taragon. Unfortunately, Taragon was seriously injured in a hunting accident, and they only just made it back to Polem before he succumbed to his injuries and died. Alone in a foreign town, Clover now has the solemn task of taking her brother's ashes home to Feruto. It's a three day journey if she goes by the most direct route, although that will involve passing through the dangerous forest. If she goes around, it'll add another day to the trip. I opted to browse the full shopping lists rather than the lighter "Picnic" rules. Since a waterskin only holds a day's water, and there's no rules for refilling it on the way (I guess the GM could place rivers or streams along the way, and rain might give a refill opportunity), the trickiest part of solo travel is making sure you have enough water. Normally a party would have a 15-day barrel of water, but Clover can't carry one by herself and can't afford a pack animal. Her equipment is as follows. 'g' is for Gold and 's' is for Size. Size numbers in square brackets are the Size of equipped or stowed items; such items count as Size 0. Boar Spear (0g, [3s]) - Chosen as her trained weapon. Gross Smelly Raincoat (224g, [3s]) - Oiled with animal grease for a funky smell. The mantle is made of sticky fur. Uncool Smelly Climbing Boots (252g, [1s]) - Questionably made out of an unknown creature's hide. Has big claws on the toes. Large Backpack (40g, 5s) - Holds 10s of gear. Used Tent (96g, 3s) - Her brother's old battered tent (Durability 2). Total cost is 998g (leaving her 2g spare), and total Size is 9 out of her Carrying Capacity of 14. Her personal item is the urn containing Taragon's ashes. Well, I think she's about all ready to start her journey! Next time I'll post an Actual Play of her first day's travel. Wish me luck!